This will be our last week of printing tiny furniture; after a few more days we'll have a full set and will post everything to the Thingiverse Customizer so that all the summer movers out there can print-and-plan their new spaces. Today we printed C's room, including a modular IKIEA Linnmon table-desk with corner piece and a small chest of possibly-discontinued IKEA Trofast drawers. Settings: Replicator 2 on .3mm/low, with the bureau printed on its back and the desks printed upside-down to enable printing without supports or raft. Technical notes, OpenSCAD flavor: The desk module builds a simple inverted-C shape and the cornerdesk module is just with the same code with a cylinder removed from one corner. 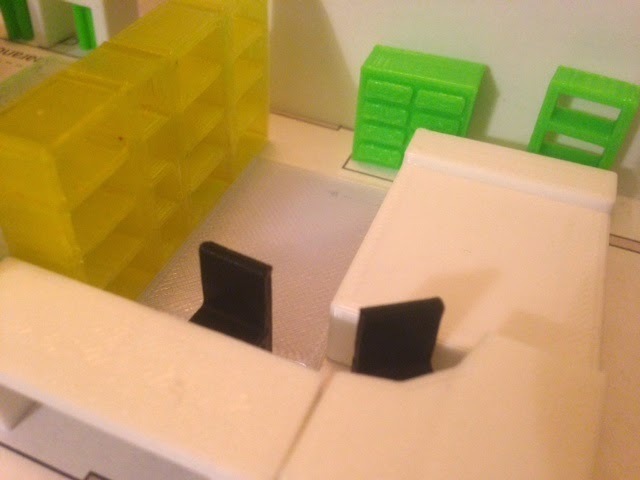 The bureau module is a modified version of the bookcase module from Day 232, with drawers as shifted two-up shelves that stick out instead of make holes. It's adorable and I wish we had more than one chest of drawers to print!